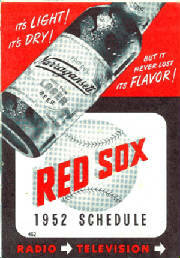 Narragansett was the beer of the Boston Braves starting in 1944 and the Red Sox in 1946. These were the first sponsorships of any professional sports teams by a brewery in the U.S. Gregory Theberge’s great website on RI brewery history, rhodeislandbreweryhistory.com, chronicles these relationships and includes a dual Red Sox & Braves schedule from the 1947 season, among other great images from the brewery’s history. The Braves sponsorship lasted until they left for Milwaukee after the 1952 season, at which time Narragansett beer shifted their baseball sponsorship focus entirely to the Red Sox. However, there was an overlap period when ‘Gansett and their announcer Jim Britt were pitching the “Hi Neighbor” slogan for both the Braves and Red Sox between ’46 & ’51. Up until 1951, the two teams only broadcasted their home games and the schedules were set up so that they were never home at the same time, so Britt was able to call the games for both teams. In 1952 this changed and both the Sox and Braves decided to start broadcasting all games, home AND away. Britt made the fateful decision to stay with the Braves and the search was on for the next Sox announcer …enter Mel Allen protege Curt Gowdy. The timing of this change went hand-in-hand with the popularization of the Sox throughout New England, when the Braves left town the next year, and the growth of television sales throughout the region. Thus, it was Gowdy who became the voice and face of both the Red Sox and the “Hi Neighbor, Have a ‘Gansett!” slogan in 1952 and would remain so for the next 15 years. 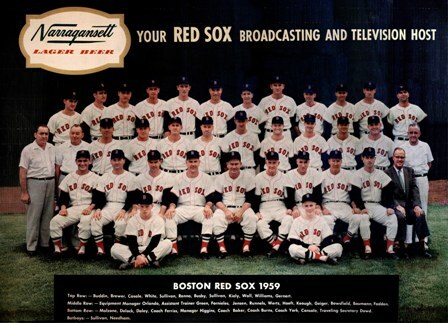 In total, the relationship between Narragansett beer and the Red Sox would last 30 years from one pennant winning season in 1946 to another in 1975, but it was those 15 Gowdy years that most of the old-die hards remember. In ’75, the sale of Narragansett beer to Falstaff was finalized and one of the first things the new owners did was cut the Red Sox relationship. This was the beginning of the end (temporarily) for ‘Gansett. Today, Mark Hellendrung and the team of New Englanders have brought Narragansett beer back to prominence in the region, and we are proud to say that our beer is once again sold in Fenway Park. Hi neighbor, have a ‘Gansett the next time you’re at Fenway!